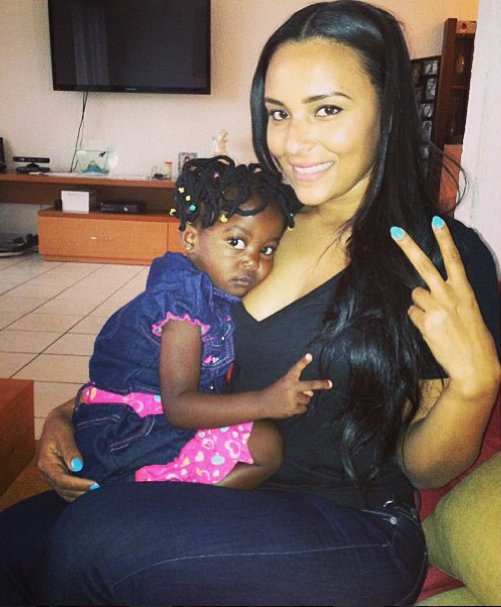 Gabonese beauty Eudoxie Agnan, better known as Ludacris’ girlfriend, recently went back to her home country to meet family perhaps, and also give back to less fortunate kids. As part of her charity acts, Eudoxie decided to give away dolls to Gabonese kids and she shared some pictures on Instagram. However, people weren't too thrilled about the gifts because the dolls were white. Some people on social media felt that Eudoxie was sending the wrong message by giving away white dolls to African kids, as she was perpetuating the "white is right" image portrayed by society. An Instagram user even commented,"I have a beautiful 5 year old daughter and she is struggling with accepting that black girls are just as beautiful as white girls… And I have to keep correcting her." Eudoxie was expected to bring black dolls to Africa and show African girls that black is beautiful. "The perks of having nice little sisters. 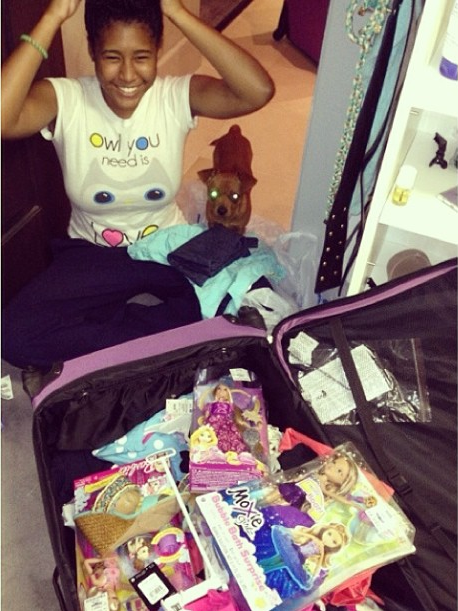 @unfabulousmuch_ helping me pack gifts to take home. @fortheloveofluckyalso helping. Lol"
Anyone trying to tell me what color gifts I should be giving, don’t worry I will give you the chance to do the giving. I’m saving your info and will be contacting you once I get back to receive the black people gifts you will rather I give away in Africa. You will get the chance to show me your giving hearts by sending the gifts to my office in ATL. And make sure all the clothes you wear, the car you drive, the house you live in are BLACK. If you are black everything you wear, drive, drink should be in the color BLACK. As a black African child, born and raised in Africa, I must say that the color of the dolls my mother bought for me was not really a big deal. All we wanted as kids is play and have fun with the dolls. However, the only reason why we were getting white dolls is because back then, there were no black dolls and we had to do with what we had. I do not believe that children care about the color of a doll, but it does not mean that skin color is not an issue in Africa. Light skinned and mixed girl are seen as prettier in some regions. I even remember in primary school, everybody wanted to be friend with a girl in my class because she was mixed. That girl received many compliments and people always wanted to touch her hair. In Africa we see many girls who relax their hair to have it look like white people's hair. African women bleach their skin because they believe that it makes them prettier. So black Africa, just like any other community in the world, struggles when it comes to body image and race. Now, are white dolls responsible for our distorted perception of beauty? No, but they do contribute to the phenomenon. I believe that there is a subliminal message hidden behind the dolls. Even though we African kids are very crafty and will play with any type of toy, we aren't blind either and we can see that the white doll looks more like what we see on TV vs. who we see on our streets. When you add this to the message that the media send, the bleaching and hair relaxing of our sisters, it eventually makes for a dangerous environment for our daughters. Was Eudoxie wrong for giving away white dolls? Not at all, she really wanted to do something good. I am not sure that most of her critics have done anything this charitable even when they could. And do those who expected Eudoxie to bring black dolls in Gabon know that the Central African nation has an important number of white people? Consequently, you see a lot of girls who are mixed and light skinned just like Eudoxie. In my opinion, Eudoxie could have been more sensitive and picked dolls with different complexions. The dolls could have been more than toys, they could have been a teaching tool for girls about the beauty in people of any race. Eudoxie failed to think that way and it is fine, however I do not agree with her answer to the critics. Dolls are not cars, clothes nor drinks, they are made in the image of human beings. Eudoxie should have acknowledged the implications a white doll may have in predominantly black communities, because they are real. We are not in the 80s anymore, black dolls are accessible. All in all, giving dolls to little girls is a charitable act, but this was also an opportunity for us to learn more about ourselves and what we want to see in our society.